WePay was recently acquired by JPMorgan Chase. This acquisition immediately impacts Chase’s Merchant Services division but I believe the bigger opportunity is in "Bank as a Platform". Bank as a Platform is a massive opportunity to open revenue channels and catalyze business.WePay’s technology would drive deposits, partner adoption and expansion, and revenues across JPMorgan Chase’s product portfolio all while accelerating innovation in financial services. What is Bank as a Platform ? Today, innovation in financial services is held back by old banking infrastructure and regulations. As a result, banks are peaking deposits as consumers are demanding new experiences. As the rate of innovation bypasses existing bank infrastructure and revenues, banks are seeing continual disintermediation and consolidation. The right technology solves this problem by turning banks into financial services platforms. The solution is to abstract all parts of financial services and core banking infrastructure into APIs that developers can easily integrate into their financial service applications. As a result developers leverage the platform to innovate on top of regulated banking infrastructure and financial services. This also means banks can leverage developers to reach new customers, drive deposits, and benefit from network effects, unlocking long-term profits and making them indispensable to future innovations. The vision for bank as a platform is to accelerate all financial services globally, drive all deposits through these platforms, and build the infrastructure for this new era of technology. However, bank as a platform cannot be achieved by all banks since consolidation is likely. With WePay, Chase is taking the work out of payments for both our business clients and the software providers who serve them. WePay is first turning Chase Merchant Services into a platform. Next, JPMorgan Chase should use WePay to build "Chase-as-a-Platform", abstracting much of it's financial service portfolio. WePay and JPMorgan Chase release APIs and a developer support community. Platform partners begin to build innovative services across new and existing markets. Platform partners innovate internal business processes. Platform partners begin to form a network of complementary services that interact. JPMorgan Chase coalesce unstructured data generated by this platform with their own structured data, unleashing new data-driven decision models and unveiling new service models. JPMorgan Chase begins to engage in data and capability sharing partnerships with other third party platform partners. WePay’s platform supports a thriving ecosystem of payments, lending, core banking, and other financial services for JPMorgan Chase’s financial service portfolio. As the network size increases, Chase-as-a-Platform becomes indispensable to the developer and banking ecosystem. Platforms with network effects serve as foundations for virtuous cycles of innovation. JPMorgan Chase has a unique opportunity to join an elite few who have turned themselves into platforms. Why platforms? Platforms enable an ecosystem of companies to create complementary consumer-facing services that funnel revenue back into underlying system. Facebook built social networks. Then, they made it easy for developers to integrate their applications into the Facebook platform. The mutual benefit: Developers use social data to create new experiences and Facebook drives revenue as a result of collecting usage data. Salesforce built an enterprise cloud CRM. Then, they made it easy for developers to integrate and extend the core Salesforce platform. The mutual benefit: Developers use the platform to build complementary services and Salesforce sells more licenses as a result of enhanced services. Apple built devices. Then, they made it easy for developers to build and distribute apps to and through their devices. The mutual benefit: Developers gain distribution to accelerate business growth and Apple sells more devices as a result of better applications. WePay has proven the bank as a platform thesis. WePay already built the core foundation for Chase-as-a-Platform, which includes their payment engine, risk models, and world-class customer support workflows. They built value-add into their platform for developers including APIs, SDKs, and an integration support ecosystem. WePay has procured developer integrations including platform partners and third party application partners. They continue to win developers’ hearts and minds with APIs that allow customized end-user experiences and by taking on the burdens of compliance and risk. Accelerating the Future of Financial Services. I hope JPMorgan Chase has Chase-as-a-Platform on its roadmap. The success of bank as a platform will depend on the readiness of Chase to adopt it. There is massive upside to the bank that gets this right. Chase has that opportunity and acquiring WePay is that first critical step. Bank as a Platform was presented by COREFX at the Money2020 Conference, October 2013. 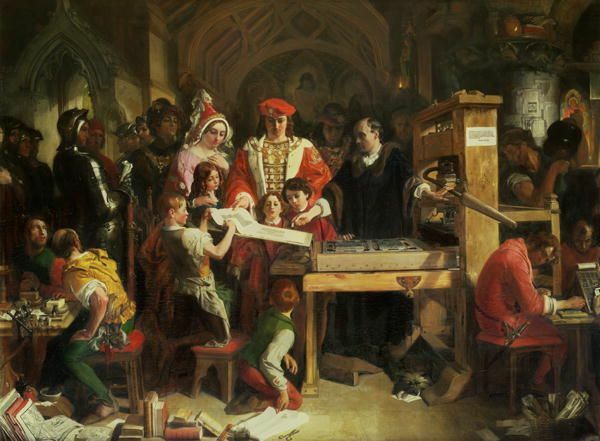 Cover image: Caxton shewing the first Specimen of his Printing to King Edward the Fourth by Daniel Maclise. The printing press accelerated innovation and catalyzed many businesses. Image taken from Wikipedia.org.